The time is 1939.White South Africa is a deeply divided nation with many of the Afrikaner people fanatically opposed to the English. The world is also on the brink of war and South Africa elects to fight for the Allied cause against Germany. Six year old Tom Fitzsaxby finds himself in the Boys Farm, an orphanage in a remote town in the high mountains, where the Afrikaners side fiercely with Hitler's Germany. Tom's English name proves sufficient for him to be ostracised, marking him as an outsider. And so begins some of life's rougher lessons for the small lonely boy. 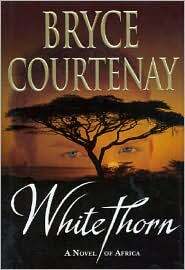 Like the whitethorn, one of Africa's most enduring plants, Tom learns how to survive in the harsh climate of racial hatred. Then a terrible event sends him on a journey to ensure that justice is done. On the way, his most unexpected discovery is love.